Wisconsin is in court trying to defend its legislative plan, which is being challenged on explicitly partisan grounds. That’s rare and new, and Wisconsin is not doing well. A new metric for partisan gerrymandering, the Efficiency Gap, is providing a court-friendly measure of partisan effects. Former U.S. Attorney General Eric Holder is building a targeted, state-by-state strategy for Democrats to produce fairer maps in the 2021 redistricting process. 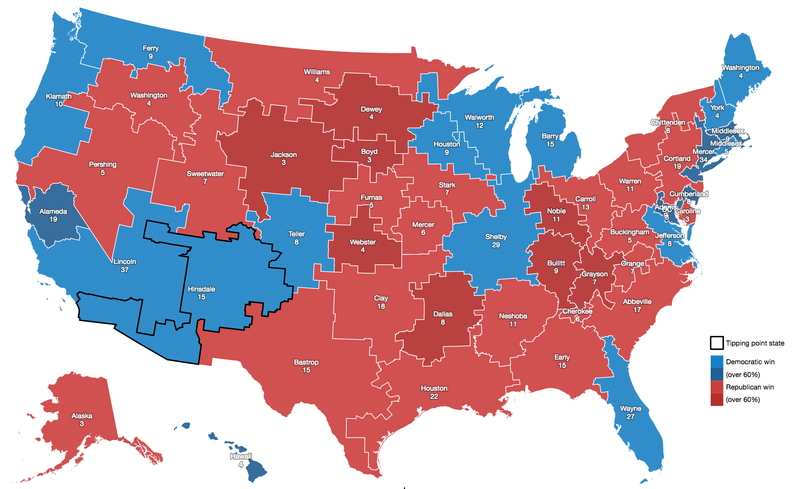 Use this map to find out what three districts you’re in. Combined with Jowei Chen’s simulation approach, my overall impression is that the arbitrariness of districts combined with the ease of calculating measures like the efficiency gap make this a basically intentional activity. There is not an underlying ideal district plan to be discovered. Alternatives can be rapidly generated, tested, and deployed with a specific outcome in mind. With approaches built on simple code and detailed databases, district plans can be designed to counteract Republican overreach. 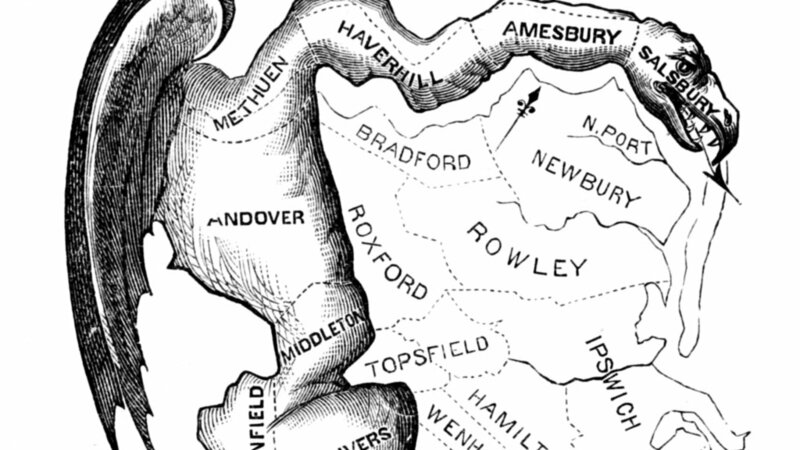 There’s no reason for fatalism about the chosen compactness of liberal towns. I’m interested in partisan outcomes, so I’ve been researching how to calculate the efficiency gap. It’s very easy, but heavily dependent on input data. I have some preliminary results which mostly raise a bunch of new questions. 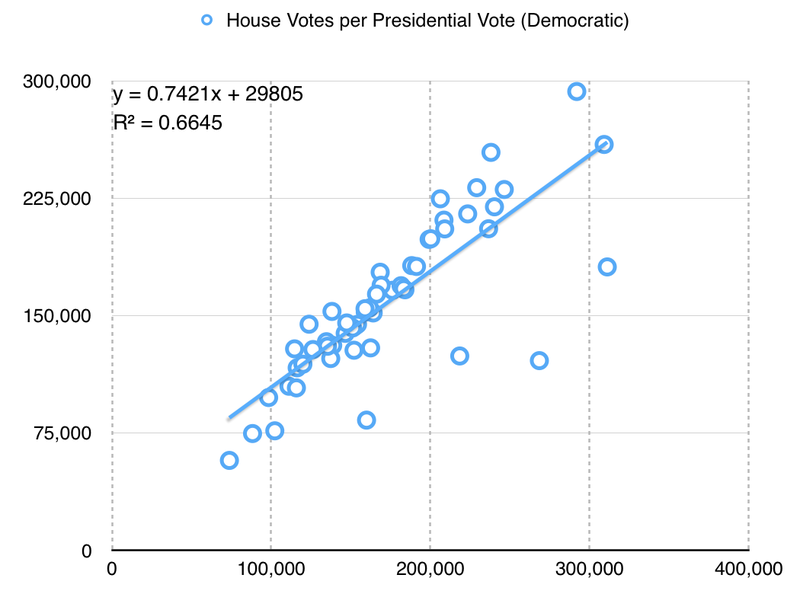 The “gap” itself refers to relative levels of vote waste on either side of a partisan divide, and is equal to “the difference between the parties’ respective wasted votes in an election, divided by the total number of votes cast.” It’s simple arithmetic, and I have an implementation in Python. If you apply the metric to district plans like Brian Olson’s 2010 geographic redistricting experiment, you can see the results. These maps show direction and magnitude of votes using the customary Democrat blue and Republican red, with darker colors for bigger victories. So that’s interesting. 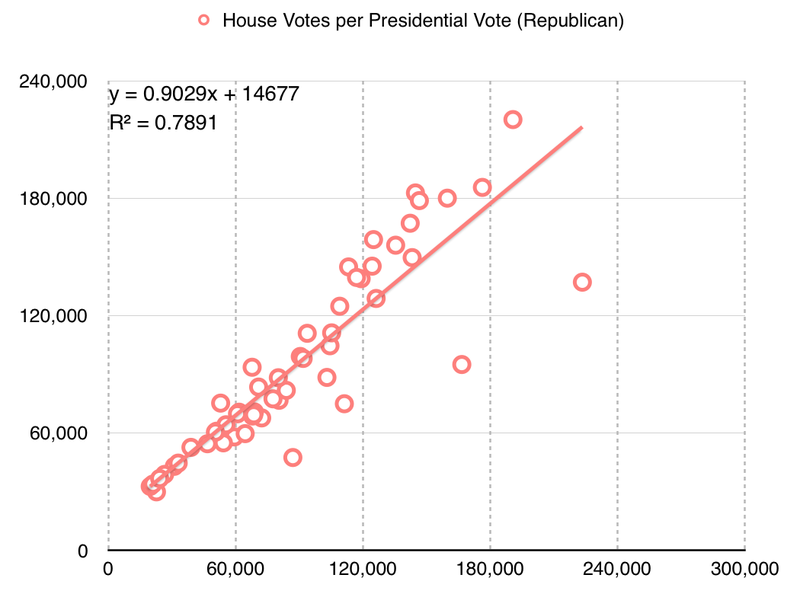 The current California U.S. House efficiency gap shows a mild 0.3% Republican advantage. Olson’s plans offer a big, unfair edge to Democrats, though they have other advantages such as compactness. This one shows a crushing +15.0% gap for Democrats and a 52 to 6 seat advantage. This plan wouldn’t be legal due to the population imbalance between counties. When these precincts are resampled into larger districts using my resampling script, vote counts are distributed to overlapping districts using a simple spatial join. 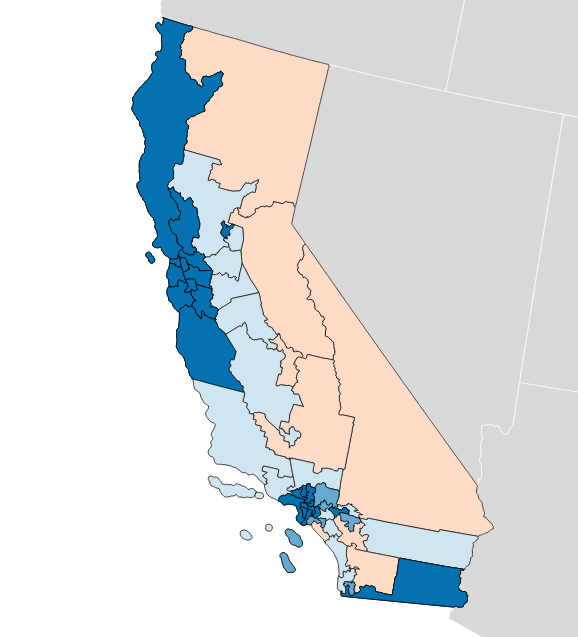 I applied this process to the current U.S. House districts in California, to see if I got the same result. There turns out to be quite a difference between this and the true U.S. House delegation. In this prediction from LA Times data the seat split is 48/8 instead of the true 38/14, and the efficiency gap is 8.6% in favor of Democrats instead of the more real 0.3% in favor of Republicans. What’s going on? The particular values here aren’t hugely significant, but it’s important to know that I’m doing a bunch of massaging in order to get a meaningful map. Eric McGhee warned me that it would be necessary to impute missing values for uncontested races, and that it’s a fiddly process easy to get wrong. Here, I’m not even looking at the real votes for state houses — the data is not conveniently available, and I’m taking a lot of shortcuts just to write this post. They are more loyal voters, I guess? 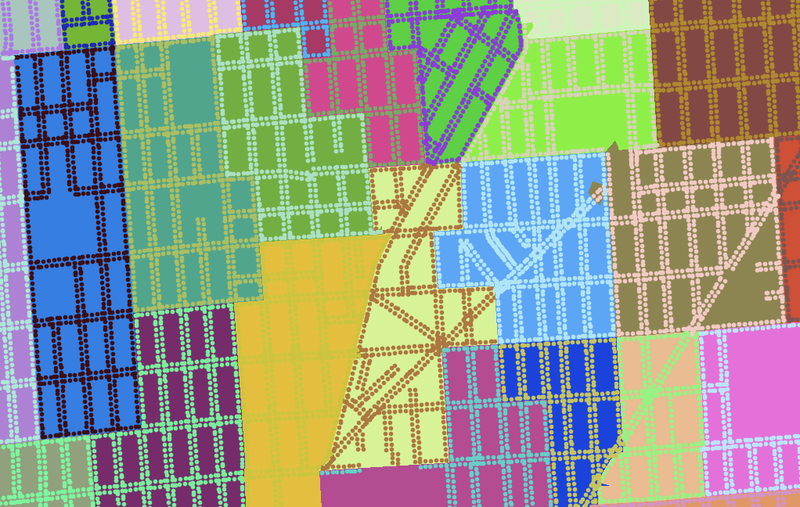 Availability of data at this level of detail is quite spotty. Imputing from readily-available presidential data leads to misleading results. These simple experiments open up a number of doors for new work. 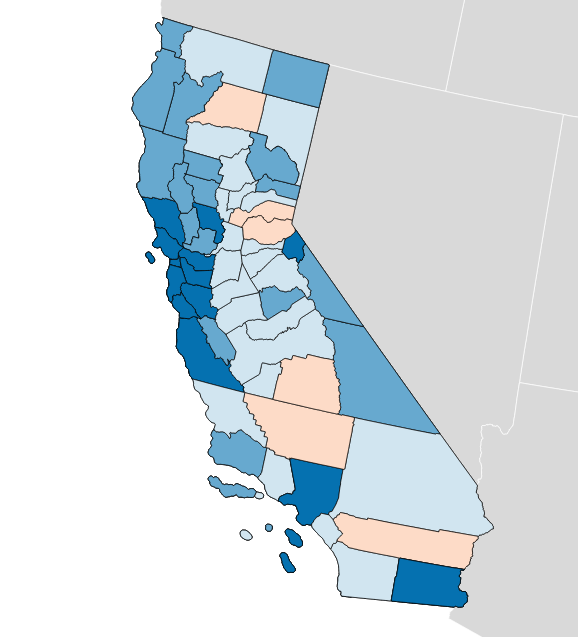 First, the LA Times data includes only California. Data for the remaining states would need to be collected, and it’s quite a tedious task to do so. Secretaries of State publish data in a variety of formats, from HTML tables to Excel spreadsheets and PDF files. I’m sure some of it would need to be transcribed from printed forms. Two journalists, Serdar Tumgoren and Derek Willis, created Open Elections, a website and Github project for collecting detailed election results. The project is dormant compared to a couple years ago, but it looks like a good and obvious place to search for and collect new nationwide data. Second, most data repositories like the LA Times data and Open Elections prioritize statewide results. Results for local elections like state houses are harder to come by but critical for redistricting work because those local legislatures draw the rest of the districts. Expanding on this type of data would be a legitimate slog, and I only expect that it would be done by interested people in each state. Priority states might include the ones with the most heavily Republican-leaning gaps: Wyoming, Wisconsin, Oklahoma, Virginia, Florida, Michigan, Ohio, North Carolina, Kansas, Idaho, Montana, and Indiana are called out in the original paper. This was difficult, but doable at the time with a week of effort. My hope is to continue this work with improved data, to support rapid generation and testing of district plans in cases like the one in Wisconsin. If your name is Eric Holder and you’re reading this, get in touch! Makes “call me” gesture with right hand. Code and some data used in this post are available on Github. Vote totals I derived from the LA Times project and prepared are in this shapefile. Nelson Minar helped me think through the process.